To facilitate compliance with The Joint Commission's requirements, this optional Auto-Retracting Kit is available for the Vertical Lift High Traffic models. It automatically retracts the keyboard into the storage position when the system is not in use. Includes keyboard tray lift assembly, wrist rest, multiple covers (grey, black, white), hook & loop and adhesive strips. Compatible with the following Vertical Lift part numbers: 60-593-216, 60-593-200, 25-022-100, 25-022-101. Kit uses existing keyboard tray from the Vertical Lift. Compliant with NFPA 101-2006 18.2.3 & 19.2.3: anything mounted in hospital hallways must not protrude over 6 inches (152 mm) from the wall. Weight Capacity: 0.75 to 2.5 lbs (0.34 to 1.13 kg). Includes weight of keyboard, mouse, mouse pad, wrist rest and adhesive materials. 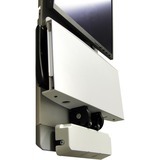 Monitor height should not exceed 15.75 inches (400 mm), assuming VESA hole pattern is centered on the monitor. Keyboard depth should not exceed 7 inches (178 mm).